As the agency that champions the arts, we strive to integrate the arts into all aspects of city life. Mayor London Breed at a Prop E campaign event. 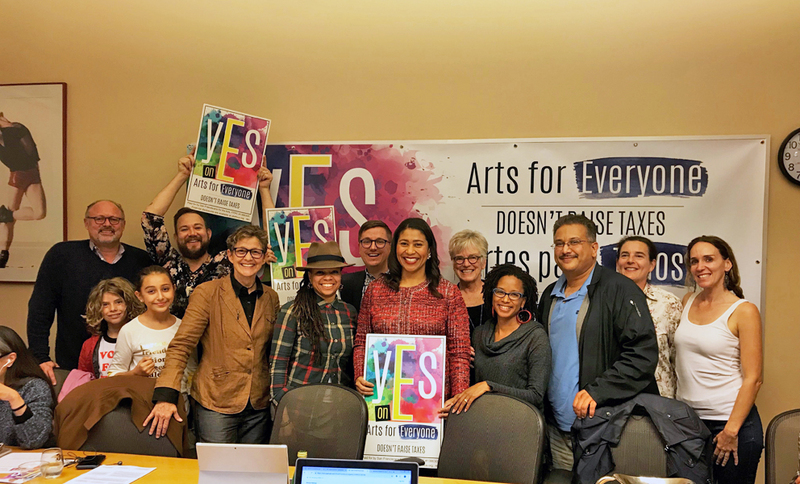 San Francisco, CA— Mayor London N. Breed, Director of Cultural Affairs Tom DeCaigny, and leaders from San Francisco’s diverse arts and culture community celebrated the approval of Proposition E, the restoration of the historic hotel tax allocation for the arts. Prop E allocates 1.5 percent of the existing 14 percent hotel tax for arts and cultural programming. Restoring the nexus between the hotel tax and the arts ensures that arts funding will increase along with the hotel tax, which is estimated by the City Controller’s Office to grow by 3.4 percent per annum. Prop E will increase investments in existing arts and cultural programs. It significantly augments the current budgets of the $5.3 million Cultural Equity Endowment, which supports small to mid-sized arts nonprofits and individual artists. Additionally, it will support the $3.2 million Cultural Center Fund, which provides operational support for the city’s six cultural centers, four of which operate city-owned facilities. Both funds are administered by the San Francisco Arts Commission. Prop E also includes funding for new arts and culture priorities. A new $3 million fund will support the city’s cultural districts, which currently include: SOMA Pilipinas, Calle 24, Japantown, Compton’s Cafeteria Transgender Cultural District in the Tenderloin, SOMA’s Leather District, and the Bayview African American Cultural District. Prop E also establishes a new $2.5 million Arts Impact Endowment Fund, which will address emerging needs in the arts and culture sector. The Arts Commission will undertake a community based needs assessment to determine how to maximize the impact of this new fund. For more information on Prop E, visit ArtsforEveryoneSF.com. Sign up for our newsletter to receive notifications about events, gallery openings, artist talks, grant deadlines, and calls for artists. © 2017 San Francisco Arts Commission. All rights reserved.